George Gao covers the United Nations for IPS. He focuses on diplomatic negotiations, human rights and U.S. foreign policy. He also writes about environmental issues, public health and social movements in the greater New York area. George earned his B.A. from Vassar College in international politics and environmental studies. 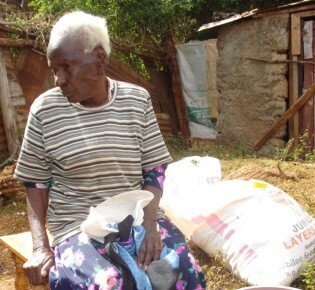 Wambui Karunyu, 72, and her seven-year-old grandson are the only surviving members of their immediate family. Karunyu’s husband and five children all succumbed to the hardships of living in the semi-arid area of lower Mukurweini district in central Kenya. When U.S. President Barack Obama tried to drum up momentum for airstrikes in Syria to punish and deter the use of chemical weapons, he failed to gain much of a following. The China pavilion is a red, inverted pyramid in Shanghai that was built for the city’s bustling 2010 World Expo. While the pavilion pays some homage to China’s ancient past, it mostly shows off China’s 21st century ambitions, with as much swagger as the 2008 Beijing Olympics. Edward Snowden, 29, left behind a comfortable lifestyle in Hawaii as a private contractor for the Pentagon's National Security Agency (NSA) because he did not want to help create an "architecture for oppression" for fellow citizens. U.S. President Barack Obama is set to host his Chinese counterpart Xi Jinping on Jun. 7-8 for their first bilateral meeting as heads of state. Figuring on their agenda is how to address a precarious North Korea, which is armed with a small nuclear arsenal and vying for a bigger one. For many in the international community, the iconic sculpture outside the U.N. Visitors’ Centre appears more prominent today, as the majority of member states tightened its knot by adopting the first ever Arms Trade Treaty (ATT). Viktor Bout earned a few monikers in his heyday: “Merchant of Death”, “Sanctions Buster” and “Lord of War”. He’s the poster boy for illicit arms brokers – a guild of shadowy intermediaries who link arms suppliers to their end users. The U.N. organ tasked with maintaining international peace and security harbours a serious conflict at its core. A spate of legal battles in the southern state of Louisiana has shed new light on the unfair recruitment and employment practices of Filipino guest workers at several companies in the United States. Peter “Pete” Seeger is a 93-year old U.S. folk legend who resides near Wappingers Falls in southern New York. He can be spotted occasionally on the traffic-heavy Route 9, flanked by world peace signs and armed with a banjo. The U.N. has opened up public platforms to engage the world on how best to replace the expiring Millennium Development Goals (MDGs) and frame a new development agenda, post-2015. Some of the most harrowing cases of gender-based violence Kathryn Bolkovac came across while working as a U.N. human rights investigator in Bosnia involved a perpetrator dubbed “the Doctor” by the women and girls he abused. The “Spirit of America” is one of 10 ferries that carry passengers from Manhattan to Staten Island. Its keel – which lies on the bottom of the boat and carves through the waters of New York Harbour– was built with steel from the collapsed Twin Towers.